The Third Order is by far the largest of the Franciscan orders. It was created by St. Francis in 1221 because many married men and women, and diocesan clergy, were asking to embrace his style of life and could not enter either the first or second order. Within the Third Order of St. Francis, it is necessary to distinguish between the Third Order Regular and the Third Order Secular. Eventually some of these tertiaries started living in communities. These later developed into a religious order professing vows of poverty, chastity and obedience and now referred to as Third Order Regular (TOR). Members of these communities can be male or female but they live in community according to their gender. This branch of the Franciscan Family was officially founded in 1447 by a papal decree uniting several groups. 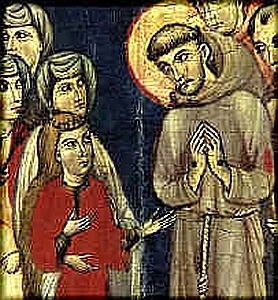 The Third Order Secular (Ordo Franciscanus Saecularis, in Latin), known as the Secular Franciscans, includes devout persons, both men and women. Members do not live in community, but live their everyday lives in the world. However, members do gather together in community on a regular basis. They profess vows and commit themselves to living the Gospel according to the example of Francis. The process of becoming a Secular Franciscans involves a commitment of from 18 to 36 months of formation. There are nearly 13,000 Secular Franciscans in the United States today. For contact information concerning a local fraternity in your area, all: 1-800 FRANCIS (1-800-372-6247), and follow telephone message directions, and the caller who is seeking out a local OFS Fraternity will receive a return call with contact information in the area of their zip code.